Since the middle ages, diamonds have been a desired treasure. But, until now, investing in natural diamonds has not been accessible for most investors. The technical expertise needed, and the lack of reliable, quality standards has been a key barrier for individual investors looking to diversify into diamonds. That has now changed. Today, high liquidity and transferability, the important traits that help diamonds retain their intrinsic value, and offer an excellent hedge against inflation or loss of currency value, are readily available through International Bullion Exchange (“IBX”). “Demand for diamonds may grow at double the pace of supply through 2020.” — Bain & Co.
Only diamonds with the rarest of qualities in all “Four Cs” – cut, clarity, color and caret, are considered Investment Grade Diamonds (“IGDs”), which are the only diamonds IBX offers. Prices for diamonds of this quality have increased, in many cases, by as much as 15% a year the last four decades, and are expected to accelerate even more in coming years. According to Bloomberg News, prices are poised to rise for the next several years as increased spending on luxury goods in China, India and the Middle East outpaces supplies of the precious stone. Diamonds are 1000 times rarer than gold, and only 1% to 2% of diamonds qualify to be an IBX, Investment Grade Diamond. 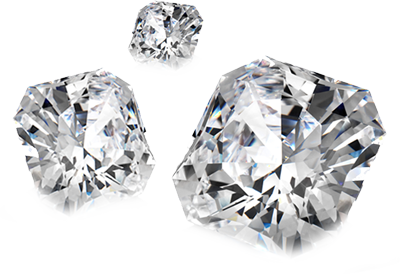 Diamonds, the hardest of assets, are known to flourish during times of inflation. They are also completely private. Millions of dollars in diamonds can be placed in a small safe, or in some cases, in the front pocket of your jeans, and most countries do not require you to disclose or register your diamond holdings. All IGDs purchased from IBX come with a third party appraisal of as much as 40% above the purchase price. Every diamond bought or sold by IBX is certified by the Gemological Institute of America (GIA), a non-profit company and the most respected name in diamond grading, and an associated certificate and appraisal of your IBX Diamonds is always provided with each purchase. This is the only way to ensure the exact grade of each diamond in your portfolio. Additionally, each diamond you purchase from IBX is hermetically sealed by GIA and has been laser-inscribed with its report number. This inscription can be seen at 10X magnification on the girdle of the diamond and can be viewed at the GIA website for authenticity. Your IBX Account Executive can show you how to view it! Since every diamond in your IGD portfolio has a GIA certification, and loose diamonds retain their qualities, the loose diamond trading market has a spot value for every diamond based on its certification. Diamonds, being a rare gem and a tangible object with limited supply, have historically grown on average every year. The smart investor knows to walk away from anyone who says “you can’t lose,” and diamonds are just as susceptible to market fluctuation as anything else. IBX cannot guarantee their growth potential. What we can do, however, is Guarantee that every diamond you purchase from IBX can be sold back to us at any time for the highest bid price of the day with no fees or commissions! All diamonds purchased from IBX include free, insured delivery to anywhere in the United States.